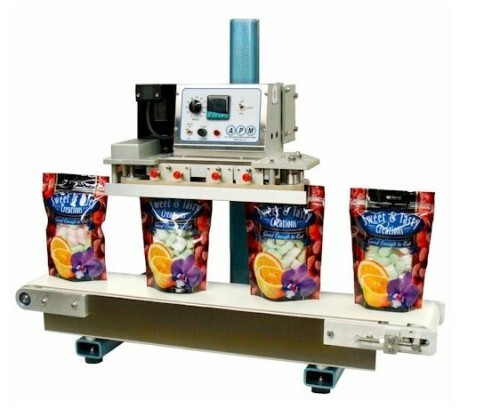 TCBSDM-3/8 - Doug Brown Packaging Products, Inc.
New from APM is the Tabletop Conveyorized Band Sealing system with synchronized lower support conveyor. Designed especially for stand-up pouches. Variable speeds up to 35 feet per minute. Quality seals of 3/8” wide are achieved through the use of special heavy duty wear resistant laminated Teflon bands. Seals 1/8” and 1/4” wide also available. Digital Temperature Control with PID Autotune maintains consistent heat and assures quality hermetic seals. Designed to seal materials: Polyethylene, Polypropylene, Laminates, Nylon, PET/ Polyester and Foil. Unit is designed with 5” long heating zone and 5” long cooling zone for greater flexibility in product sealing of difficult materials with temperatures up to 450 degrees +/-2 degrees Fahrenheit. Optional single line Embossing Coder for product marking is available upon request. Hard Chrome plated sealing bars followed by Nickel plated Cooling Section reduces wear assuring longevity of use. Electrical 110 VAC 10 amps/ 60 Cycle. No compressed air required!